This two-day symposium, hosted by Drs. 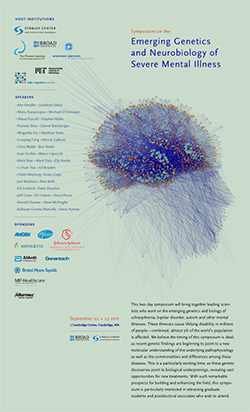 Ed Scolnick of the Broad Institute’s Stanley Center for Psychiatric Research, Li-Huei Tsai of MIT’s Picower Institute and Guoping Feng of MIT’s McGovern Institute, brought together leading scientists who work on the emerging genetics and biology of schizophrenia, bipolar disorder, autism and other mental illnesses. These illnesses cause lifelong disability in millions of people—combined, more than 3% of the world’s population is affected. We believe the timing of this symposium is ideal, as recent genetic findings are beginning to point to a new molecular understanding of the underlying pathophysiology as well as the commonalities and differences among these diseases. The four sessions reflect the flow of basic discoveries to new treatments, as the goal of this symposium is to reveal vast opportunities for new treatments for mental illnesses. Topics include Genetics of Schizophrenia and Bipolar Illness, Genetics of Autism, OCD, Depression and Mental Retardation, Emerging Biology and Functional Data, and Clinical Applications. Speaker List: Jonathan Sebat, Maria Karayiorgou, Michael O’Donovan, Shaun Purcell, Stephan Ripke, Pamela Sklar, Daniel Weinberger, Matthew State, Guoping Feng, Patrick Sullivan, Christopher A. Walsh, Ben Neale, Evan Eichler, Mario Capecchi, Elaine Lim, Mark Daly, Elly Nedivi, Li-Huei Tsai, Ed Boyden, Helen Mayberg, Rusty Gage, Jon Madison, Alea Mills, Peter Visscher, Jeff Conn, Ed Holson, Sasha Gragerov, Ronald Duman, Steve McKnight, Baltazar Gomez-Mancilla, Steve Hyman.